This post describes the method I have been using to follow changes in soil nitrogen using only simple equipment and inexpensive test strips. It evolved from earlier experiments involving an attempt to stimulate nitrification in an organic plant growth medium. See the post “A method for observing the soil Nitrogen cycle in action” for more information and some test results. This is a qualitative test procedure and exact measurements are not taken but an attempt is made to keep volumes as consistent as possible. An estimate of cost based on the price of the test strips, and other consumables is about $1.75 per test. The design of the Erlenmeyer flask allows for separating liquid from solid portions of a mixture and facilitate the filtration process. Holds about 30mL of filtrate. For inserting test strips into the test tube. For timing color development of test strips. 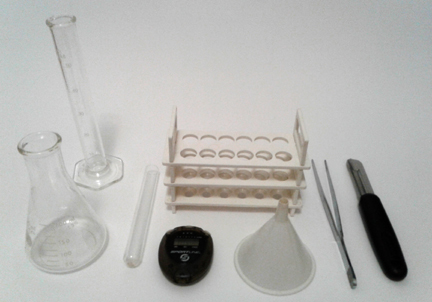 Used to make 10:1 dilution of test solution in order to extend the range of test strips. I use an inexpensive equivalent of Whatman #1 but a coffee filter should work. Place close to 50ml of soil into a clean container. I use a 250mL Erlenmeyer flask but a jar or similar container can be used. The container should have a mark at 50mL for consistent results. Add about 50ml of de-ionised (DI) water to the flask or other container. This will extract a good portion of the soluble compounds from the soil. Keep in mind that some of the soluble material will remain with the solids and nutrients that are cationic such as ammonium can be bound by negative charges on soil particles and will not be dissolved. Swirl the flask for one minute to thoroughly mix the soil and water. Let the mixture stand in the flask for at least one hour to equilibrate. I usually let the mixture stand for a couple of hours or longer giving the soluble substances in the soil a better chance to dissolve. Decant the liquid through a paper filter. The filtrate drips into a 50mm x 150mm test tube. This size test tube holds about 30ml of filtrate. I have found by trial and error that the mixture of 50ml of soil and an equivalent volume of water yields about 30ml of filtrate. 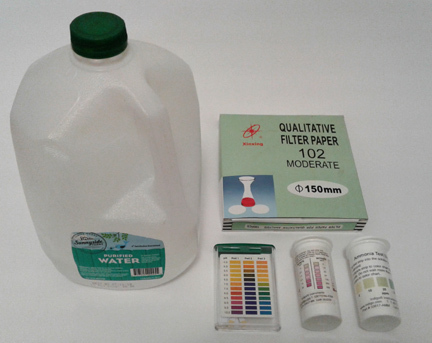 Test strips for pH, Ammonium and nitrite-nitrate are used to measure the corresponding properties of the soil extract solution. I keep a record of the test results in a text file along with notes about test conditions and information about the soil sample being tested. The measurements are graphed using scidavis a free scientific data graphing program but a spread sheet program could be used instead.